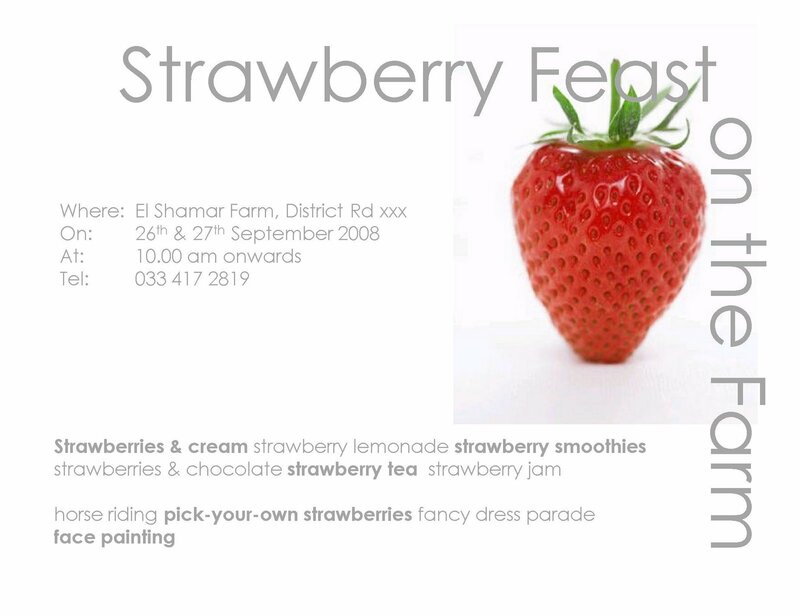 When I am in South Africa, I will be helping my sister with her Strawberry day on the farm. For those of you who don’t know – my sister and her husband, are strawberry farmers in the Umvoti District, KwaZulu Natal. We are now desperately trying to ensure that everything is done with a Strawberry theme. Today, I even asked Luso restaurant for the recipe to their Strawberry Soup. I know what is in it now, so I have to try and make it. If anyone has anything they make with strawberries which is interesting and tasty, please let me know! And of course, for any of my friends in South Africa who would like to come along that day to have fun, let me know and I will give you the full details. (The invite above is a very rough draft only and I don’t have the correct information yet). E.g. I think the ‘pick-your-own’ plan has been shelved!